When I was a teenager, the first heavy metal band from Luxembourg I ever heard was Funeral Pyre. They put a lot of effort into their music, but back then, in the late Eighties and early Nineties, it wasn’t so easy to record a good sounding album on a budget. A few demos and albums later, the band was no more. The voice of Thousand Lakes, Rony Willems, then joined Thousand Lakes, a heavy metal band that has been around for nearly a quarter century now. Two albums were released in 2003 and 2007, and in the early Tens, the band renamed itself Shirkadath. Probably because no one knew how to spell or write that name, it was back to Thousand Lakes in 2015. And now, twelve years after their last album, they are back with album number three, titled Beneath The Surface. Rony Willems is in his early Fifties now, and deserved respect for not giving up. Fact is that his high-pitched screams may not be to everyone’s taste, but he shows on the new album that when it comes to regular metal singing, he is actually really a good vocalist. Beneath The Surface contains eleven songs and clocks in in just over one hour, and frankly, it could have been a quarter hour shorter, to make for a leaner listening experience, and yet there is plenty of not only good, but surprisingly great, material to be found here. The album begins with a trifecta of catchy metal tracks that show the band from its more accessible side. The opener Doom Of Phobos is an old school metal smasher that owes a lot to early Eighties heavy metal. The solid production throughout the album highlights how well these guys have kept over the years. Apart from Willems’ idiosyncratic vocals, it’s Corneille Hoffmann’s guitar playing that is from out of this world on the entire album. I guess he might be the best guitarist from Luxembourg. He may not play as progressive as the youngsters in their metalcore / djent bands, but his chops show that his playing comes more from the gut than from the brain. He’s also not ashamed to deliver these vintage sounding guitar solos that somehow must have disappeared sometime in the Nineties. Angelscream is the band’s shortest track, and is another pleasant old school excursion with a really cool chorus. The same goes for Play The Fool, another compact heavy metal track that sounds like coming from at least thirty years in the past. Fall Of The Nazarene is at seven minutes a longer track, and takes the party a bit out of the music. Instead we get a mix somewhere between NWOBHM and occult metal, giving this song an atmosphere not unlike Mercyful Fate. And frankly, Rony Willems’ screams at times remind of King Diamond. The album’s middle then somehow loses momentum although the music still remains highly listenable. Suffer Me is a highly varied metal track with mellower parts and distorted bass guitar, but doesn’t have the same dark energy like the track preceding it. French Riviera Lady is a little silly, to be honest. The band flirts with the early glam metal sound of the Eighties, with bands like W.A.S.P., Ratt, Mötley Crüe and even early Van Halen coming to mind. The really great guitar sounds makes sure that Thousand Lakes never sound like the later outpourings of glam. Kill The Light shows the band from a groovier side, trying to add a more modern sound to their music, which is ok but less exciting than their other songs. 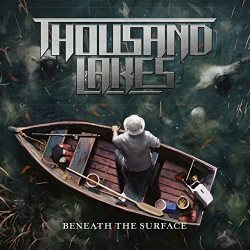 I was afraid that Thousand Lakes delivered their best songs at the beginning of the album, but it’s the final few tracks that have some surprises left. Darkened Skies may start rather traditionally, but has a fierce chorus that will sear through your ears. By The Blood Of Christ is the band at its most epic. This ten-minute song has some really great moments, although also some repetition, making me wonder if it couldn’t have been more powerful at for instance only six or seven minutes. Another highlight is the strange Machines From The Sky, which sounds like a science fictional version of Accept, with even a vocoder part in the chorus. The album ends with The Curse Of The Black Witch which, no surprise, has some more Mercyful Fate parallels, in a good way, though. I understand that when a band doesn’t release any new music for a dozen years, they are eager to come back with a bang. Thousand Lakes have really written a lot of new tunes over the years, and they wanted to put them all on their album. And why not? Beneath The Surface took me by surprise. I didn’t expect the guys to sound that dynamic anymore. But as one of the founders of the Luxembourgish heavy metal sound, Rony Willems has no right to disappoint. Welcome back, guys! In an age where it is often more about technique than songwriting, you have showed us what it was about in the first place!